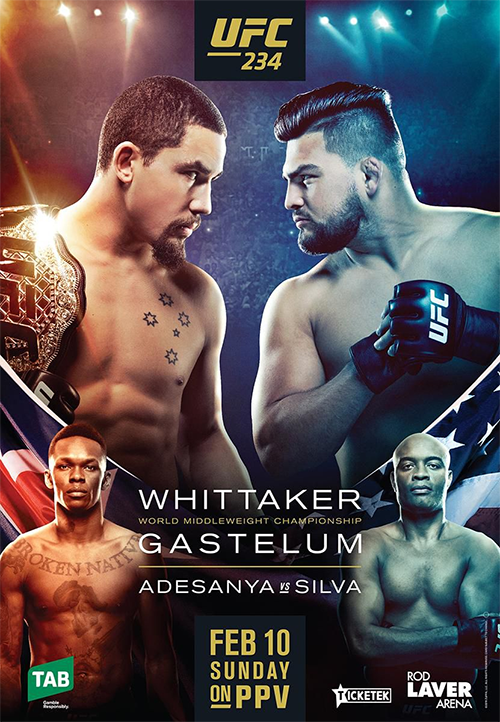 UFC 234: Adesanya vs. Silva is an upcoming mixed martial arts event produced by the Ultimate Fighting Championship that will be held on February 9, 2019 at Rod Laver Arena in Melbourne, Australia. A UFC Middleweight Championship bout between current champion Robert Whittaker (also The Ultimate Fighter: The Smashes welterweight winner) and The Ultimate Fighter: Team Jones vs. Team Sonnen middleweight winner Kelvin Gastelum was expected to headline the event. However, Whittaker was forced to pull out the day of the event due to a hernia in his abdomen and is unable to fight. Israel Adesanya vs. Anderson Silva is expected to serve as the main event. 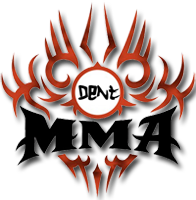 Ryan Spann was expected to face Jim Crute at the event. However on January 25, it was reported that Spann was forced to pull out due to a hand injury and was replaced by Sam Alvey. Alex Gorgees was expected to face Jalin Turner at the event. However, it was reported on January 27, that Gorgees was pulled from the card for an undisclosed reason and he was replaced by Callan Potter. UFC President Dana White told ESPN.com’s Brett Okamoto on Saturday (early Sunday morning locally) that middleweight champion Robert Whittaker is out of his scheduled title fight with Kelvin Gastelum after being hospitalized the night before. He was diagnosed with a hernia and was set to undergo surgery. Rob Whittaker has so much bad luck man! This event was all right considering the circumstances. Both Montana De La Rosa and Lando Vannata looked awesome (!) and won in such convincing ways, it was just beautiful to watch their performances. The main event was very cool and I'm glad Silva didn't get knocked out or submitted. He put up a fight! Really bummed out regarding Whittaker and it's just too weird that these things keep happening to belt holders the day before the fight for it to be ok. I missed Joe Rogan commenting the Silva fight. But I understand traveling to Australia is rough when you have 3 kids and a business lol. Jon and Dom did a great job as always.